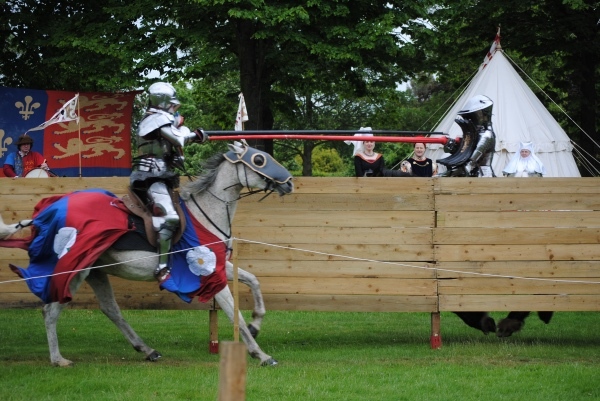 • Jousting returns to Hampton Court Palace this weekend with visitors invited to join King Henry VIII and his court as they watch this sporting spectacle. Along with the thrills and spills of the tourney, visitors can also partake of the delights of Tudor food and music and a specially commissioned play featuring chief minister Thomas Cromwell as he prepares a royal banquet to celebrate the king’s marriage to Anne of Cleves. The event kicks off with a royal procession in which knights will greet the king with a display of heraldic pageantry before they head to the jousting arena at the East Front Gardens. Admission charge applies. Runs on 14th and 15th July. For more, see www.hrp.org.uk. PICTURE: A previous jousting event at Hampton Court Palace (David Adams). • Venture into the hidden world of shadows in a major new exhibition opening at the Natural History Museum in South Kensington on Friday. Afraid of the dark? takes visitors deep into underground caves, to the depths of the oceans and into the pitch blackness of night as it recreates habitats usually hidden from view and presents hundreds of incredible creatures, some brand new to science, which have adapted to a life without sunlight. The sensory display allows visitors to touch some of Britain’s nocturnal animals, hear the sounds of the deep sea, smell the distinctive aromas of a bat cave and see through the eyes of a cave boa using infrared technology. Runs until 6th January. Admission charge applies (children aged up to 16 are free). For more, see www.nhm.ac.uk. • Bauhaus designers and teachers Walter Gropius, Marcel Breuer and László Moholy-Nagy have been honoured with an English Heritage Blue Plaque at the Belsize Park home where they lived and worked in the 1930s. Gropius (1883-1969) founded the art school known as Staatliches Bauhaus in Weimar in 1919 with Breuer (1902-1981), who initially joined as a student before becoming director of furniture workshops in 1924, and Moholy-Nagy (1895-1946) who joined the staff in 1923 and edited the house magazine and 14 books. All three went on to have successful careers in the field of design and architecture and live in flats in the Grade I-listed Isokon Building, completed in 1934 and originally known as the Lawn Road Flats, in Belsize Park. For more, see www.english-heritage.org.uk/visit/blue-plaques/. Send all inclusions to exploringlondon@gmail.com.